The next session of this School will commence on the 3rd day of February next and terminate the 27th November following. The course of instruction will include all the branches necessary to constitute a thorough preparation for College. The trustees have employed Mr. M. Lewis to take charge of the School, and will promptly procure aid whenever it is needed. This gentleman is strongly recommended as a Classical and English Teacher by Dr. Maupin, Principal of the Richmond Academy, Mr. A.L. Holladay, formerly Professor of Ancient Languages in Hampden Sydney College, and Mr. R.G. Branch, at this time Professor of Ancient Languages in the same institution…. The village of New Store and planters in the neighborhood were prepared to take in boarders. Was Charles McKinney’s son Philip, b. 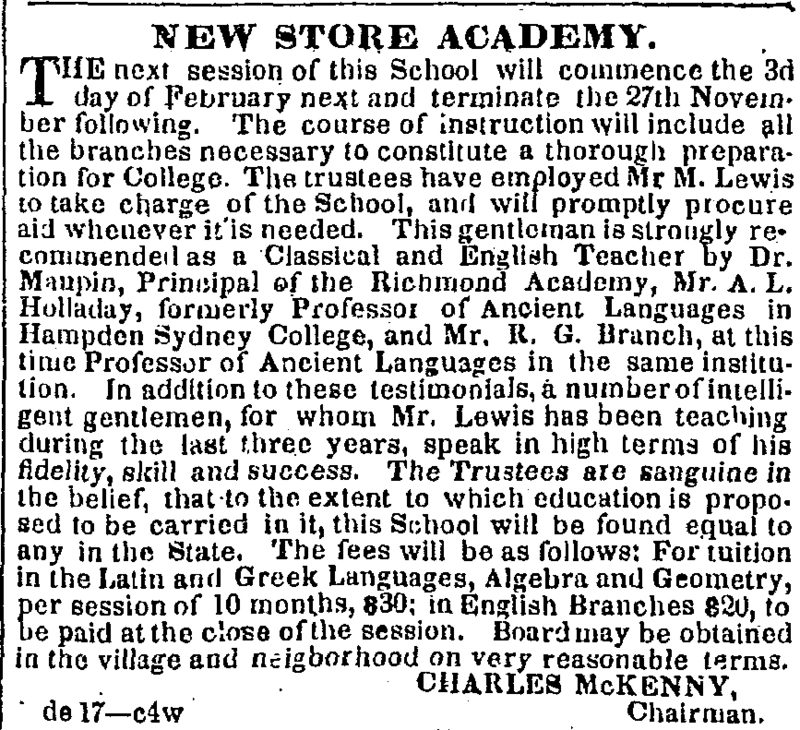 1832, first educated at New Store Academy? In 1850, the McKinney family was living in New Store and Charles was a merchant. Living with the family was William Dinwiddie, teacher, age 21, from Campbell County, Virginia. Did Mr. Dinwiddie teach at the Academy? The question remains. . . .
Who were these enemies of Messrs. McKinney and Jones? And what did they have against the New Store Academy? Special thanks to sleuths Fran Harris-Hill and Hal Coleman who helped discover New Store Academy. I have a picture of Prof Holladay from 1880. It’s in “On This Hill.” Other info on some of the other folks from New Store Academy. I cannot add much at all, but the Dinwiddie family in Campbell Co., VA included a William Dinwiddie (born about 1745) who married a Frances Hunter. Their son John Dinwiddie (born about 1780) married a Mildred Campbell (a granddaughter, as I recall, of Henry Campbell and his wife Charity of Amherst Co., VA). There was a chancery court case in Campbell Co., VA in 1820 that involved the above John Dinwiddie, and a William Davidson (possibly a member of my overall Davidson family out of Buckingham….but my research continues on that) was a witness. I certainly suspect that the teacher named William Dinwiddie who was in Buckingham Co., VA in 1850 was somehow out of the above William Dinwiddie/Frances Hunter family. By the way, the above William Davidson who was the referenced witness in Campbell Co., VA in 1820 was a LIKELY son of the David Davidson who had been on the 1810 Campbell Co., VA census (age 45 or older; David may have died before 1820). That David Davidson lived next-door to two of the brothers of the above Mrs. Mildred (Campbell) Dinwiddie (Cornelius Campbell and Lewis Campbell….and all three were children of a Joel Campbell of Amherst Co., VA). The David Davidson on the 1810 Campbell Co., VA census MIGHT very well have been a son of the older David Davidson (born circa-1715) in my Davidson family who married Mary Giles and who died in Buckingham Co., VA around 1798. The younger David Davidson who was in Campbell Co., VA in 1810 is the last major “unknown” that I am still “chasing,” relative to my overall “Davidson family tree.” I really need a male Davidson DNA donor who can “trace himself” back to that specific David Davidson to take the Y chromosome DNA test, in order to be certain that this was truly part of my Davidson family out of Buckingham Co., VA….but a lot of research, combined with the “process of elimination,” makes that “connection” seem very likely.